Prominent & Leading Manufacturer from Tiruchirappalli, we offer diesel locomotive engine camshafts. A Diesel Locomotive Engine Camshafts is a shaft to which a cam is fastened or of which a cam forms an integral part. It is mainly used for operating Poppet Valves. It consists of a cylindrical rod running the length of the cylinder bank with a number of oblong lobes protruding from it, one for each valve. 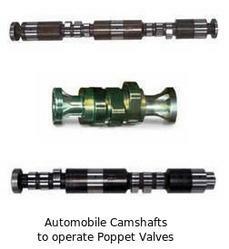 Looking for Diesel Locomotive Engine Camshafts ?